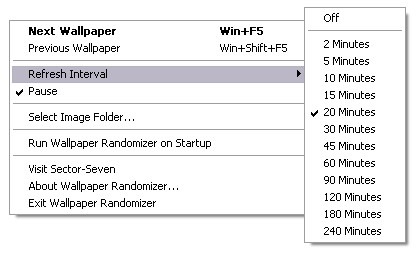 Wallpaper Randomizer is a small system-tray application to change your desktop background. It can be set to change wallpaper at regular intervals, at every restart, or to using a hotkey. Supported image formats include BMP, PNG, JPG and GIF. How to extract: Download the ZIP package and extract to a folder of your choice. Launch Wallpaper Randomizer.exe. Added: Support for relative paths. Added: Open Configuration File menu item. Using your own photos/Images portably without the need to access and change the settings in 7 would be one reason. Carbonize> Not everyone has Windows 7 yet. Not sure why you would need this on Windows 7 since this functionality is already built in.